Recently, we showcased just some of the many ways that ScoreVision multimedia scoreboards can be customized beyond just changing a mascot or a color. This week, we’re excited to introduce you to one of the newest members of the ScoreVision family, Dublin High School! Dublin High School is a public high school in Dublin, CA and home to the Dublin Gaels. 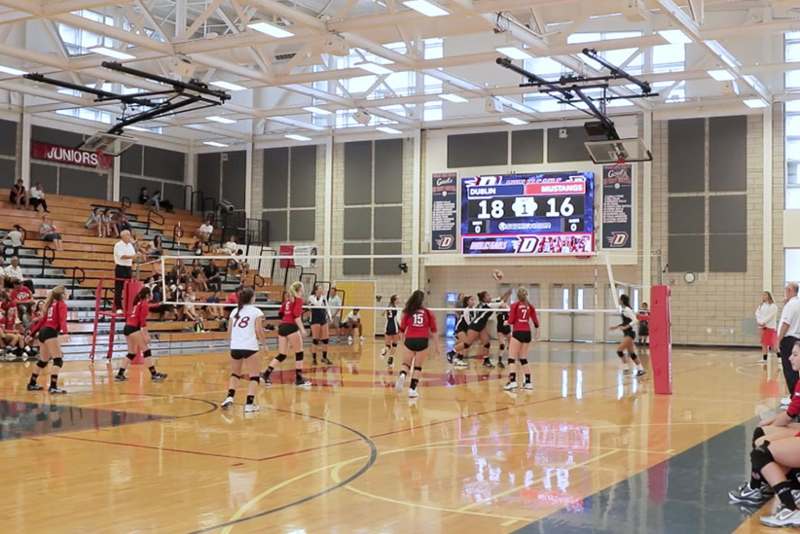 The administration at Dublin was searching not only for the perfect scoreboard upgrade, but also for a way to showcase the school’s robust video production program. Watch our video to hear their story! Dublin’s video production program is relatively new, but it is growing quickly. The school looks forward to utilizing their new ScoreVision multimedia scoreboard system to connect students and curriculums all across the school. “We have huge aspirations for what the scoreboard is going to be used for. I think the scoreboard can be used in a variety of ways that we don’t even know yet,” said D’Ambrosio. For now, Dublin plans to use the multimedia scoreboards to showcase hype videos, use it for PE classes and guest speakers, allow athletic teams to watch highlights or break down game footage, and create content for curriculum that can be used during classes. Other schools in the community are starting to take notice of Dublin’s new multimedia scoreboard system too. Peter Scarpelli, athletic director at Dublin High School, is also excited about the fundraising potential with their new multimedia scoreboard system. We’re excited to see all the exciting things Dublin High accomplishes with their new ScoreVision system, and we know the school is too. Interested in learning more? Check out last week’s post on some of the customizable features of a ScoreVision multimedia scoreboard system and stay tuned for our next post! Follow us on Twitter and Facebook to be the first to know when new content released. To see how a ScoreVision multimedia scoreboard system can elevate your school’s athletic program, bring students from all areas together, and alleviate funding issues, contact us today!